Living with the Law: A brilliant debut, but the kiss of death? Stories vary regarding how Chris came to meet Daniel Lanois, who was instrumental in getting Chris a recording contract and supported him during the recording process. Did they meet when Chris was playing a NYC gig at Mondo Cane? One Sunday morning when Chris joined a friend on a photo shoot in a NYC park? At a barbeque in New Orleans? I didn’t know the “real story” until I purchased some artist’s proofs from photographer Karen Kuehn (she shot the iconic photo of Chris among the santarios). It seems that Karen met Chris when he played a gig at the Exterminator Chili restaurant on Church Street in NYC. Instead of throwing cash in the tip jar, she gave him a note “good for one free photo shoot” and told her boyfriend Dan Lanois that he had to hear Chris. Chris eventually took her up on her offer, and they became good friends. [T]he company sent out postcards to “tastemakers” and followed up a few days later with an advance promotional cassette mailout. Whitley undertook a promotional tour in June and sample 12 inches were sent to college radio. A full CD Digipak was sent to “taste-makers” on June 18 and the following day the promo CD … was blitzed to AOR/ALT radio stations. …. Teaser ads were placed in various significant publications and after the album was eventually released on July 2 there were full-color ads in magazines such as Billboard, Spin, Musician, and Guitar. All that promotion certainly garnered a lot of interest, and the fact that the album was not only very good but also unique and timely guaranteed press interest. Time Magazine featured Chris among its “New Troubadors,” singer/songwriters who create “highly personal rock ‘n’ roll” and whose songs “have passion, intimacy and a shared but singular voice.” And the reviews? Uniformly laudatory! 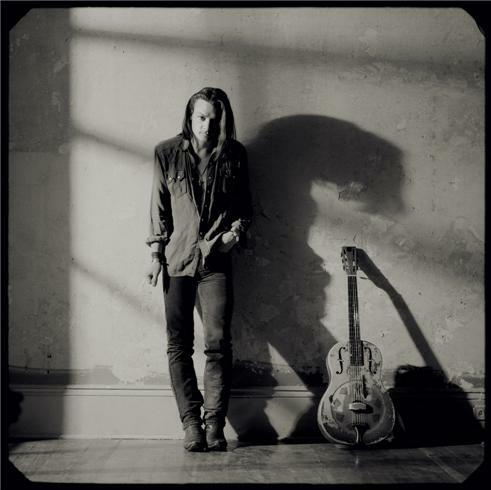 Paul Evans, Rolling Stone: Chris Whitley’s extraordinary debut album, is fantasy blues – bona fide poetry and National steel guitar conjuring dream imagery from some surreal western movie. Riveting and original, Whitley mines roots music not as an imitator but as a visionary who trades on archetypal symbols and classic riffs to fashion his own twilit American mythology. …. [T]here hasn’t been music as wise as Whitley’s in quite some time. Karen Schoemer, New York Times: “Living with the Law” is about dust, danger, two-lane roads and barren lndscapes; it’s about running and feeling like an outlaw, not so much in the literal as in the emotional sense of being detached and therefore free, of being at home on the outskirts of right and wrong. Most of his songs are set just south of nowhere. JT Griffith, All Music Guide: An exceptional and mesmerizing debut, one with the potential to inspire all who hear it. An album Robert Johnson may have recorded, were he still alive. Musician: What ultimately makes Living with the Law such an arresting debut are the songs, artfully drawn and insinuatingly tuneful, coming as close to short-story writing as anything that can be hummed. An utterly addictive album. Tom Moon, Philadelphia Inquirer: Whitley … makes grand nomad music. It’s the kind of sound you’d expect from the desert – big and open, with delicate textures and stray, lonesome sounds, and lyrics that glorify solitude and the end of a wild adolescence. …. That’s Whitley’s gift – the ability to juxtapose man’s loftiest impulses with the reality of street life. Because the settings are so understated, it’s impossible to miss the drama in these songs. Even when he’s doing nothing more than celebrating the “Big Sky Country” that inspires him, Whitley turns in poignant, edge-of-the-chair performances that signal the arrival of a major voice. Greg Kot, Chicago Tribune: “Living With the Law” announces the arrival of a new songwriter/guitarist who plays and sings the white-boy blues with more conviction and authority than anyone since the debuts of Ry Cooder and Lowell George….. [Chris Whitley’s] vivid story songs are contemporary jewels. Boston Globe: Originality is rare today in any medium, so it’s a double treat to run across this exquisite new album. …. [Whitley’s] unusual bent-note singing and spare but deeply affecting lyrics mark him as a true discovery. Songs like “Living With the Law,” “Big Sky Country” and “Phone Call from Leavenworth” linger long after the music ends. Note: Rolling Stone anointed LWTL the best debut album of 1991, and The Village Voice’s annual poll of popular music critics ranked it number 9. … But Not to Chris’s Liking? As contradictory as it may seem, I’ve concluded that Malcolm Burn’s masterful, beautiful, and original production of LWTL both launched Chris’s career and signed its death certificate. As Chris noted above, LWTL is beautiful, and it certainly got our attention; but, ultimately, it did not reflect “the sound” Chris wanted to make. You might say that LWTL made a false promise: It suggested that we could expect more of the same in future releases. Not so! As much as I loved LWTL (actually wore out my first CD and had to repurchase), I was shocked and utterly repelled by Din of Ecstacy. Couldn’t listen to more than a few seconds of each track before skipping to the next. Ultimately threw the CD in an odds-n-ends drawer, where it languished for years. When I purchased Live at Martyrs’, I thought, “Gee, Chris must have written several new songs that I missed.” Hearing “Narcotic Prayer,” “WPL,” “God Thing,” and other Din songs performed acoustically, I loved them! “New Machine”? One of my all-time favorites! Many fans of LWTL had a similar reaction to Din. Donny Ienner, the Columbia/Sony chief who signed Chris on a 3-record contract, was especially dismayed. In the latest cut of the Dust Radio documentary, Ienner seems genuinely confused by Chris’s musical trajectory and mourns the “dark turn” his lyrics, his sound, and his life took from Din on. Kathleen Carey – the music publisher who promoted a LWTL demo to Ienner – dittos those feelings. As I watched their interviews, I repeatedly thought, “What’s so cheerful about LWTL? Poison girl, Leavenworth prison, ‘Momma cry and Daddy moan/Starving in some trailer home/Want to burn it down….,’ ‘I do my dreaming with a gun….’?” Granted the sound paints beautiful pictures, but the lyrics certainly do not. Thus, the conundrum, enigma, dilemma of Chris Whitley’s musical career: to achieve recognition and commercial success, he had to not sound the way he was meant to sound. Would you have noticed LWTL if it had been presented with the same sparse production as Dirt Floor? Would you have ever even heard any of its songs? Not the kind of tunes that get a lot of play on most radio stations, right? I first heard that falsetto of his while traveling over the Golden Gate in 91. I emeddiatly became obsessed. Priority, must obtain Living with the Law. His visceral writing style with the resonance of national steel and his voice. Robert Johnson would of been a fan. Lovely essay. Back when it came out, LWTL was one of my most favourite albums, it was like the soundtrack of my life for that whole year. I remember feeling so…. lost when DIN came out, I was warned by negative reviews in the British press over here but it was such a shock, and hearing of him so unhappy with that first achingly beautiful album. I couldn’t figure it out. Took awhile to get caught up by Chris’ music again with his later stuff, and then he was gone. Looking back at all of them, as a whole, his albums all make sense in a strange way, but that’s the perspective of looking back at his whole life’s work; at the time, LWTL certainly set up the wrong conception of what his music was. Glad you enjoyed the article, Ghost. I think in their acoustic versions all Chris’ music is very unified and not at all a major shift from LWTL. Wow, this is cool. Malcolm shared it with me. You still at it? Hi, Sean – Glad you enjoyed my essay. Malcolm Burn? Possibly? If so, please convey my appreciation to him. Yes, still at it: recently posted a series on the tunes Chris covered (e.g., on Perfect Day, Dislocation Blues, etc.) Hey, if you’re in contact with Malcolm, perhaps you could do me a favor and steer him to https://allthingschriswhitley.wordpress.com/?attachment_id=769 . It’s a song (listed as Rain of Clay on the bootleg file) Chris played but we can’t identify. Cover? Original composition? Thanks either way. MW: But I’d heard once that you hated that album [LWTL]. That you felt like you sold out. Do you like that song now? CW: I do. Yeah, I do. I didn’t allow myself to like that record for the longest while. Not for the first couple of years. And this is funny, now I’m doing a record with the same guy who had done that record. We hadn’t talked for the longest time, 7 years. Keyboard player and engineer. He won a Grammy last year for Emmy Lou Harris. But back then I had never been in the studio or even been produced before; so I was kind of pissed off… pissed off I wasn’t more involved. Man, I didn’t even know how to be more involved. I didn’t know what guitar sounds I was looking for. Good insight, Michael. Just listened again to Weed version, and the plaintive quality is certainly stronger. I think that Din was just something he needed to get out of his system – not in a bad way, mind you. Chris frequently commented that he had grown up on Led Zeppelin (sp?) and Hendrix and needed to do the “power trio” thing – and he did it well. And some of his last albums were essentially trios: HVH with Heiko and Matthias and SDS with H, M, and Malcolm Burn. Update: In email correspondence with Karen Kuehn, I learned that she is the photographer who took the iconic “Chris among the Santarios” photo. Karen heard Chris playing (busking) in NYC, liked his sound, and, as a tip, gave him a “one free photo shoot” card. She was dating Daniel Lanois at the time, and introduced Lanois and Chris. The rest is history…. For more info about Chris’s initial reaction to the press rush, see http://www.elsewhere.co.nz/absoluteelsewhere/3097/chris-whitley-interviewed-1991-the-law-man-living-with-the-lore/.